The International Student & Scholar Center (ISSC) is located on the first floor of Pine Dale Hall in Suite 7123. Pine Dale Hall is directly across from Health Services. For directions to the campus itself, please visit UMassD Directions. Please park in Lot 6. Follow the walkway from Lot 6 towards Ring Road. Use the marked crosswalk to cross Ring Road to the sidewalk and the entrance to Dorm Road. Follow Dorm Road staying on the sidewalk; there will be two gray stone buildings on your right. 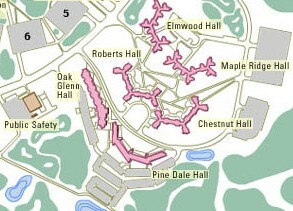 The first building is Oak Glen Hall; the second is Pine Dale Hall. Cross Ring Road at the flashing traffic light using the pedestrian crosswalk. Turn right and walk along Ring Road until you reach Dorm Road. Turn left and follow the sidewalk past Oak Glen Hall to Pine Dale Hall. The door to the main entrance is always locked. Open the blue telephone box on the wall. When you hear a dial tone, dial 6633. Someone from our office will answer the phone and then come to open the door for you. When you enter the building, turn a sharp right past the reception desk down the hall, and follow signs to "International Student & Scholar Center."